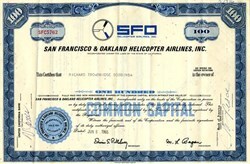 Beautifully engraved uncancelled certificate from the San Francisco & Oakland Helicopter Airlines issued in 1965. This historic document was printed by American Bank Note Company and has an ornate border around it with a vignette of the company's logo. This item has the printed signatures of the Company's President, M. F. Bagen and Secretary, Edwin Pillsbury and is over 41 years old. The certificate was folded for mailing and in EF condition. San Francisco & Oakland Helicopter Airlines (aka SFO Helicopter Airlines) used Sikorsky S-61s and S-62s connecting SFO with Bay Area locations. It was the only US helicopter service to operate without a government subsidy. The company was formed in January 1961.